Satori is a cutter rigged Westsail 32 built in 1977 and has a Westsail schooner hull kit number 04110475 and #411 in production. 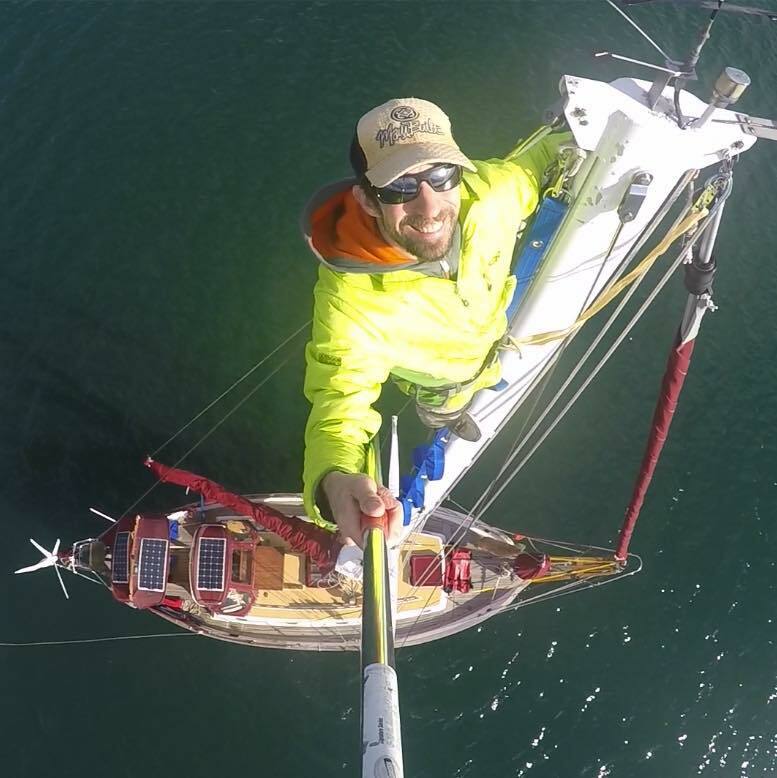 She is 32′ of fiberglass and an additional 8′ of boomkin, wind vane, and bowsprit. She is 40′ in length overall (LOA). She is capable of sailing the world given the proper equipment and experienced crew to make it happen. Some call the Westsail a blue-water boat, but I prefer the term trade-wind boat. Running downwind and reaching on long tacks are her strongest points of sail. With a consistent trade-wind of 15-20 knots, she is capable of averaging 140 – 150 miles per day. On her passage from Neah Bay to San Francisco she averaged 135 nautical miles per day. She has undergone a major refit in only three years, and is now ready for oceanic voyages. Satori has been refitted with all new sails, rigging, and her hull faired with new paint and folding propeller. She has reached speeds of ten knots over water, eleven over ground. She has endured gales in Cape Mendocino and seas bigger than I ever imagined. She is outfitted with EPIRB, Life Raft, Iridium Go!, AIS transmission, a refrigerator, hot water heater, solar and wind energy, modern electronic navigation, but is bristol and beautiful as a classic Colin Archer double ender should be. She has teak decks, a wooden bowsprit and boomkin, a very dependable Aries wind-vane autopilot, a sewing machine, a fully functional shower with the ability to heat water from the diesel stove, and many other creature comforts. 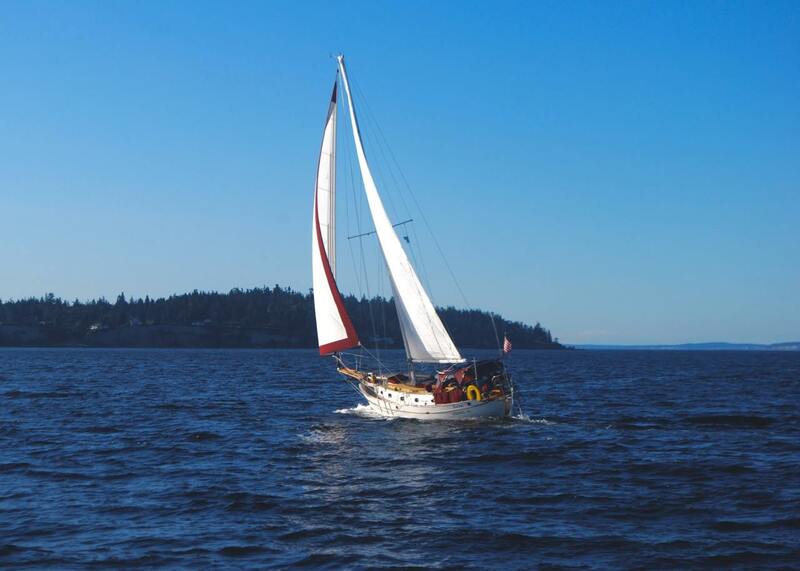 She is a wonderful live-aboard sailboat, and has proven herself in the North Eastern Pacific Ocean in the perhaps the worse conditions we may ever encounter. Before heading offshore to the Southern Pacific Ocean we will add a water maker, sideband radio, and an engine driven scuba air compressor. She will be outfitted for continuing her voyage in to the most remote regions of the world. Since I was a young boy I’ve always wanted to be a sailor. I admired Popeye, pirates, and fishermen and dreamed of having my own sailboat. As I grew older I grew a thirst for adventure. I began as a fisherman, and lived my youth on the river catching fish with a flyrod and flies I tied at home. Later I learned how to rock climb and eventually worked my way into climbing new routes. At the same time I found my greatest passion for skiing steep routes from the summits of remote cascade peaks. After discovering sailing, and the possibility of trans-oceanic voyages, I quickly adapted to living on a sailboat full-time, and sailing as a way of life. These are the chronicles of the entire voyage, from the first day I visited Satori, until now…whenever that may be. I have made the first eleven latitudes from Neah Bay to San Francisco, and now will continue my journey until we are going back up in latitudes in the southern ocean, and beyond. I checked the box for email notifications. Love your site. Nice photos. I’m a Brazilian Chemical Engineer and Criminal Expert near retirement. I have dreams like yours, and I’m building my own sailboat, a Samoa 34 made in striplanking wood and fiberglass. I intend to sail from inside the Amazonia toward a world circumnavigation. Congratulations for your blog that is very nice. Nice to see you yesterday off Foulweather Bluff; best wishes for a nice trip down the coast. When we headed south with Chaika we also left mid-July, and enjoyed harbor hoping down the coast. Are you going to do the one big passage to SF? Hi Will, yes I am in San Francisco now. I just posted a blog entry about the trip last night. I hope you enjoy reading it. I’ll see you back in Seattle at some point. Take care! I am admiring the staysil bag that you made from the Franz Schallauer pattern. I am currently trying to design a cover for a staysil and a trysil for a 43′ sailboat that will be heading around Cape Horn this winter. I would really love to have a pattern to start with and am wondering if you could share it. I’m hoping to start sewing in a couple of weeks to be completed prior to an October departure date. If you could help me out with a pattern and any further instructions I would be grateful. Kind regards. Sandra, unfortunately I do not have a pattern for the bag I made for the staysail. It’s been almost a year and I can tell you that this design is awesome. Using the compression straps makes bagging the sail much easier and quicker. If you’re looking at a trysail bag for keeping on deck, I suggest using Top Gun fabric for the whole bag and make sure to have drain grommets. For the storm jib you can go with a bigger bag since you won’t be storing it on deck most of the time. A standard sail bag size should work. Let me know what you need for additional info. I’m happy to help. Also, if you need any other advice there is a great Facebook Page called Sewing On Boats that I get a ton of info from. Lots of great ideas and helpful people in that group. Perhaps the only Facebook group that stays focused on the actual topic and everyone is super nice. I saw your SSS Bag project and was wondering if you have a pattern or sketches you could share. I would like to construct a similar sail bag for the jib on my Cape Dory 25D. Hey, Thanks for your site. wanted to email you regarding your post on wind turbine, can you email me back please. Kris. I have W32, Hull # 711. Home port: West Vancouver. I m very interested in your progress and work projects aboard.